Interesting that this is a partisan 5-4 decision. I hope we'll see more of these commissions in the future. 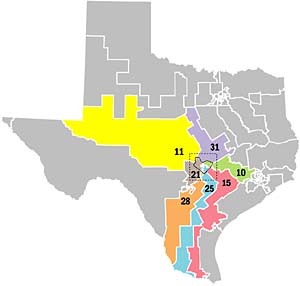 The way we draw districts in most states is shameful. In other words, I really don't support the very Constitution that I am sworn to uphold "in my heart of hearts". This is hypocrisy at its apex and should disqualify Ms. Ginsberg or any other SCJ from serving. She, or anyone no matter who appointed them, should be impeached as the Constitution prescribes. For someone to swear an oath and then, in a "ruling sense" undermine and redefine the Constitution is unconscionable and should not be tolerated by the "people". Unfortunately, too many of the electorate is "ignorant" of the real intent, history, and defined prescriptions for resolution of "grievances”, and seeks to go with the way they personally "think or feel"; either of which is dangerous and undesirable. Whether you personally like the way states define voting districts is not the rule or the point. If you don’t like it, then go with the US Constitutional Amendment process; sorry if it is “hard”. The people who would have to vote for an amendment, are the same people who gerrymandered the districts to keep themselves in power. When a system is not democratic, it is not possible to work within the system to achieve democracy. I'll delete mine. I think I accidentally used the mobile url anyway. Courts been on a roll. Was today their last day in session? I'm pretty sure NC is the most gerrymandered state in the country. It will be interesting to see how this plays out. Probably not the worst, but Austin is awful. Texas literally nullified the votes of an entire city of two million people. I think technically tomorrow is, but I don't know what other decisions they have left to announce. I think actually Pennsylvania has that title. They have had more democratic votes cast in recent elections, yet democrats hod something like 5 out of 18 seats. That's not democracy. MI is pretty bad, too. We have 5 dems out of 13 seats, and a majority of democratic voters.